The EODA Shale Marketing Committee is a volunteer group of eastern Ohio economic development professionals and other supporting organizations and companies. The EODA Shale Marketing Committee raises funds from sponsors to undertake events to develop shale-related economic development leads. Major sponsors of these events include AEP Ohio, JobsOhio, APEG, Ohio’s Rural Electric Cooperatives, Harrison County CIC, Tuscarawas EDFA, Monroe County Port Authority, Columbia Gas, Dominion Energy, MarkWest Energy, OMEGA, and Buckeye Hills. In June of 2017, EODA members and APEG worked to coordinate three different EODA Shale Marketing activities in Pittsburgh. At the PetChem Update, EODA and APEG networked with petrochemical companies and contractors, including a site selection consultant with a large project and a business from California evaluating the tri-state area for a project. At the EODA Shale Brokers Open House, APEG and EODA members met with commercial real brokers, many of whom wanted updates on shale projects and to know about prime properties in the region. Past brokers events have resulted in projects in the EODA region. EODA members continue to work these relationships. 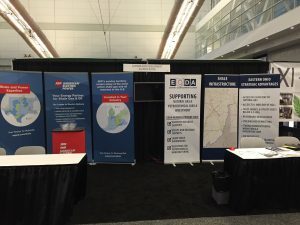 At the DUG East Show in Pittsburgh, EODA representatives and APEG met with several upstream supplier companies looking to do business in the EODA region. In March of 2018, representatives from four EODA counties joined JobsOhio, AEP, APEG, and Shale Crescent USA at the IHS World Petrochemical Conference in Houston. JobsOhio and AEP hosted a reception at the conference. The event was attended by several petrochemical companies, including PTT Global Chemical. Ohio had legitimate interest from five petrochemical companies at the JobsOhio/AEP reception and the Shale Crescent Luncheon. These are international companies that are in early evaluation stages of their projects. It is unknown at this time whether there will be any projects coming out of these meetings. It should be noted that PTT evaluated Ohio for about two years before revealing their intentions. One of the leads has already taken steps to evaluate eastern Ohio.